Just because Grandma used borax and she lived to be 95, does this mean it is safe? Is it a good choice for those trying to live in a responsible manner with regard to the environment? Or, is it like castile soap – green or not so green depending on what you buy. Borax has been known and used by humankind for centuries. It was first obtained from saline lakes in Kashmir and Tibet and refined in Europe. While most people call it borax, its technical name is sodium borate. Basically, it is a salt of the element boron. Once processed, the solid form is a white crystal powder that dissolves easily in water. Where does it come from? Under your feet, as it turns out! Most people are familiar with borax for its use in laundry or other cleaning purposes around their homes. Yet, it has many important applications across numerous industries. Everything from the manufacturing of glass, to ceramics, even metallurgy uses it! Since it is antiseptic, it is a popular ingredient in products used to whiten, disinfect, or deal with mold and mildew, like in baths and showers. The compound also helps remove stains and cut grease. Hence, it is a key ingredient in many homemade laundry detergents. Besides stain removal, it is a fairly good deodorizer to boot. Let’s take a moment to ensure we are on the same page. Borax, which is usually sodium tetraborate or sodium borate, is not boric acid! These are very different, albeit closely related, chemicals. Boric acid is far more dangerous and toxic than borax, especially when used as a pesticide. Unfortunately, many of the studies on the safety of borax don’t clearly specify which was used and much of the data is lumped together or both were studied at the same time. Borax is a known eye, skin, and lung irritant. If this makes you want to run for the hills, hold on. So are ground cinnamon and many other spices, vinegars, essential oils, and a host of other everyday substances including dust. Why does borax irritate the skin, lungs, and eyes? On top of the form, it is the pH. Borax is quite alkaline. If you remember your high school chemistry, pH runs anywhere from 0-14, with water being around 7, or neutral. Anything much below 5.5 (acidic) or above 8.5 (alkaline or basic) will generally irritate the skin, eyes, and lungs. Borax comes in at 9.3! Baking soda comes in at 8.4, which is why some people are and some aren’t sensitive to it – it is right on the line pH-wise and some people tolerate it better than others. Now, some of you may protest, how can a substance used as an insecticide and so effective at killing bugs be safe? Well, for the same reason that you can gobble down chocolate and sugar alcohols like erythritol but your dog can’t, and you can drink wine but your little feline friends can’t. There are hundreds of foods and compounds that are toxic to other creatures that are relatively and completely harmless to people! And there are things that are harmless to other creatures – like many plants – that will sicken or kill a person with apparent ease (like raw elderberries). Different creatures have different defenses and adaptations to different chemicals. Animal studies are important, but not always applicable, to human health. Now, would I use borax in skin care products, swish with a mouthwash that contains it, or eat it? No. Should we have any reservations using borax in small amounts in cleaners, disinfectants, laundry, and the like? Not currently. There just isn’t any good data that shows this naturally occurring substance poses a significant danger to people. Why are these groups against borax? Well, a few studies point to it causing reproductive issues in animals … when they are exposed to very high doses. Unfortunately, I couldn’t easily find out if the study involved the more dangerous boric acid or actual borax. What we do know is many compounds, including essential oils, are beneficial with small exposure, but larger doses can actually cause significant injury and other problems. Here’s the bottom line truth about borax. At low doses, studies found no adverse impacts from exposure to either borax or boric acid. Also, the study that is commonly cited as indicating the toxicity of borax involved feeding animals around ¼ an ounce or so of it per day (around ½% of total bodyweight)! Because of the issue of possible residues, I would understand avoiding the use of borax in the dishwasher, just out of caution. Beware of “borax free” slime recipes too … more on that below. But overall, borax doesn’t bioaccumulate in the body (build up over time with repeated exposures), it doesn’t absorb well through the skin (but it will irritate or burn it), and it isn’t considered a carcinogen. Also, environmentally, borax mining is one of the cleanest types of mining we have, right up there with salt and baking soda. In other words, boron in the soil is not comparable to elements like arsenic or lead, which play no role in human health. If You are Going Green, Does Borax Make the Cut? I would say yes, borax makes the cut as a green chemical especially compared to many other substances that can accomplish what borax can! Just go look at the ratings and data on many mold and mildew fighters, for instance. Compared to many other chemicals and cleaners, borax strikes me as, when used wisely, a safe, green option for getting many jobs done. In terms of pesticides, especially those used to deal with ants, roaches, and moths, borax is far better environmentally than almost every other option. Now, borax should be handled with care and stored out of the reach or access of small kids, who may want to play in or with the powder and eat it, thinking it is sugar possibly (they don’t do this long, the flavor is quite unpleasant!). Just like most powdered substances, improper handling creates lots of dust and can irritate the eyes and lungs. Others will say no, borax isn’t green no matter what and you shouldn’t use it. Your mileage may vary! Are there things you can use instead of borax? Yes and no. Baking soda also improves the effectiveness of laundry and has some similar properties to borax, but isn’t nearly as effective or potent. In cleaners, there are many options from vinegar to essential oils to make them more effective. But again, these all have their own risks and trade-offs as well. We use a great deal of baking soda for cleaning and deodorizing in our home, but on occasion, borax is hard to beat when you need to take things to the next level. As long as you are careful when handling it so as not to ingest or touch with bare skin, keep it away from the kids, and use in small amounts – it is safe for both people and the environment. You may already know that borax is a safe way to help get rid of ants. This substance is a common ingredient in many bug killers, so you can also use it to make homemade cockroach killer too that, if placed properly, is fairly to very effective. Combine 3-teaspoons of boric acid with 3-teaspoons of sugar and 3-teaspoons of water. Mix it thoroughly until it becomes a paste. Leave small dollops of it inside old lids or pieces of carboard where you have seen roaches. Do not put directly on floors, inside cabinets or on furniture. If you need something stronger, you can make these homemade roach cookies with boric acid that will last for years. For homemade laundry detergents, borax is a hard to beat ingredient. Use the powder if you prefer solid detergents or use liquid borax for an easily pourable mixture. There isn’t much difference between the two. 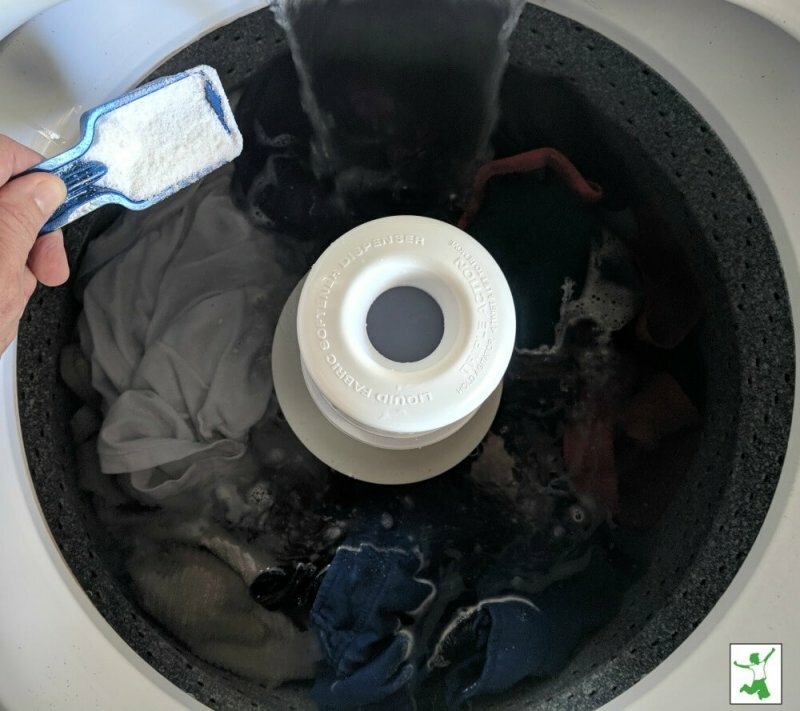 Compared to the ingredients found in many commercial detergents, I also don’t worry at all about using some borax in some of our loads of laundry (this is a great brand). We don’t use it in every load, but for especially dirty clothes or for when something is greasy or the wash needs an additional boost, we don’t hesitate to add the appropriate amount of borax for the size load. But is this concoction really borax/boric acid free? No! While some contact lens solutions don’t contain borax, they usually contain boric acid. IF the saline or contact lens solution doesn’t contain boric acid, it won’t work to make slime! So, any recipe that uses saline or contact solutions, no matter what the blogger or website says, isn’t actually borax free. Given that contact solution goes in and on your eyes, you may decide such ingredients are safe (and I would probably overall concur, occasionally playing with boric acid created slime, as long as the kids aren’t eating it, isn’t a big deal). But, don’t mislead people and call it borax free folks! Truth in advertising is important! Also, watch out, some “borax free” slime recipes use low quality commercial laundry detergents, many of which contain… borax! Even worse, they contain all sorts of other dangerous chemicals as well.